*We received a copy of Low Mess Crafts For Kids by Debbie Chapman and no other compensation. Our opinions and thoughts are our own. My boys have been fascinated with space for a long time. My youngest asked Santa for a rocket ship two years in a row so now he has two of them. When we got the book Low Mess Crafts For Kids in the mail and looked through all the cool crafts, I knew my kids would love the “Exploring Outer Space” section. We just had to make an outer space craft. 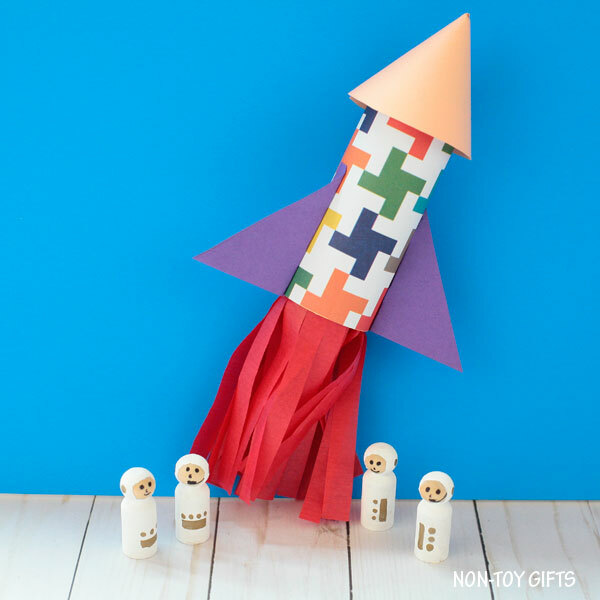 So we did a paper roll rocket ship and a few peg doll astronauts. We love easy crafts for kids and Debbie’s book is packed with 72 such project ideas. She is the creator of the blog “One Little Project” and as a mom of three young kids, she is no a stranger to messy crafting with little ones. But with her book, she wants to offer a mess-free alternative to crafting. She uses common materials and for those crafts where a bit of glitter, paint or glue is required, she shares ideas on how to keep things clean and the messes under control. I love that the book is structured by themes and each theme contains several crafts. It is the kind of crafts that serve a double purpose. They keep kids busy creating and can be used as toys. No worries if outer space isn’t your kids’ thing. They may like animals or under the sea creatures, camping or cars. There are so many options to choose from and so many magical worlds kids can explore. A while back, I bought a bag of peg dolls online for a superhero house my husband and I made for our kids. I didn’t realize they were too little for all the details I needed to paint to turn them into superheroes. So I just threw the bag into my craft cabinet. They came in handy now for the peg doll astronauts. Just the right size. 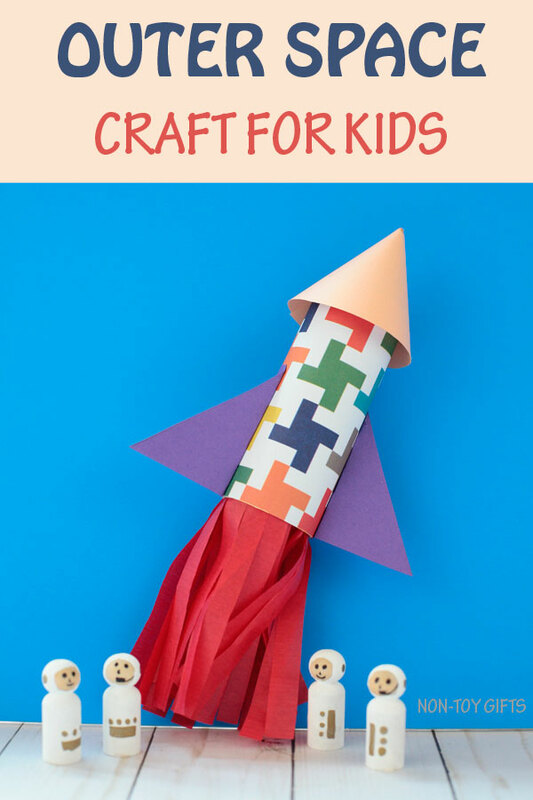 As for the rocket ship, we always have a few paper rolls in case a craft may require one. We used a pattern construction paper to cover the paper roll and we skipped adding the rocket ship’s windows as we didn’t want to cover the pattern. You can find below a list of materials for each of the two crafts. 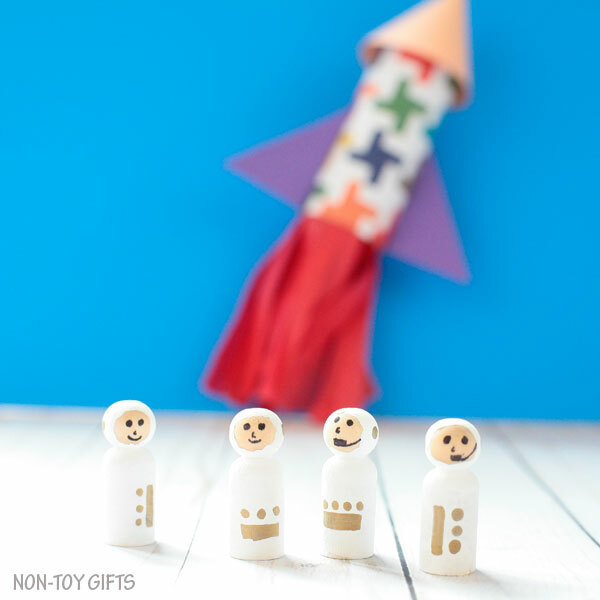 Then scroll down for the step-by-step video of how to make the peg doll astronauts. If, while watching the video, you wonder why I used glue for the astronaut’s face, you’ll have to read the book. It’s packed with little tricks like this one. Grab your copy of the book Low Mess Crafts For Kids here.